Ignacio football head coach “Ponch” Garcia will lead IHS for the fourth year, with the season-opening game Aug. 25. Ignacio High school football isn’t on life support, according to head coach Alfonso “Ponch” Garcia. He said it’s alive and hitting hard. Garcia was pleased with the turnout for practice. A report in the Aug. 3 edition of The Durango Herald indicated the Bobcats may not have enough players for varsity football in 2018. Athletic director Rocky Cundiff said the Bobcats would need 20 players to compete at the varsity level in 2018. Low numbers seem almost par for the 1A Southern Peaks League’s course. 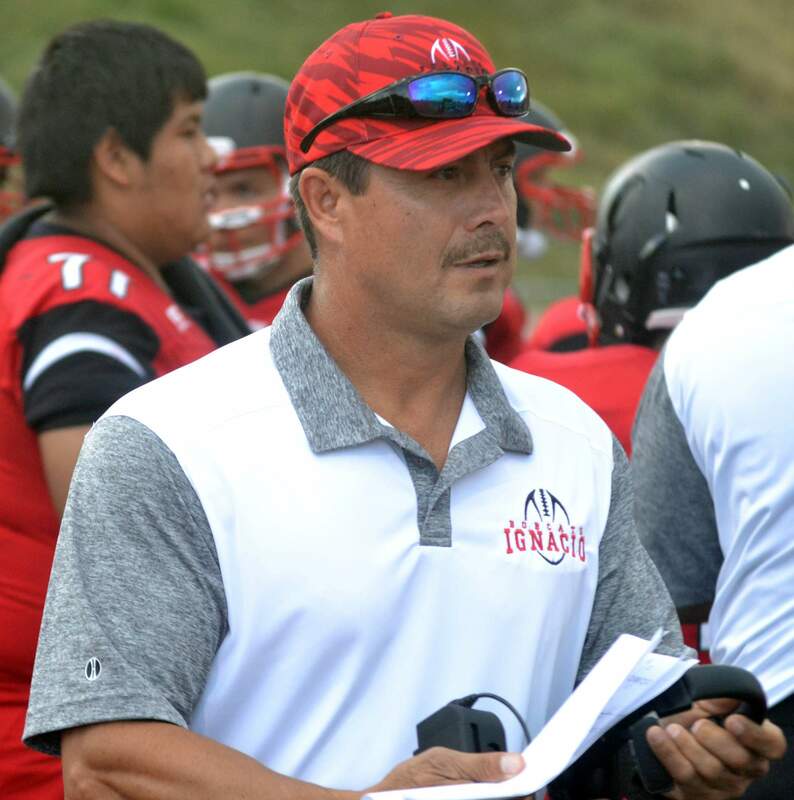 Rival Dolores is under new leadership this fall, while Walsenburg’s John Mall – also under new leadership – transferred to the 1A Santa Fe League while considering a 2019 drop to 8-man. Former Southern Peaks member Center is back in this year’s league after a year away from varsity competition. Though quarterback will again be a position up for grabs, with both Trace Lovelace and Marcus Chapman having graduated back in May, several returning players are vying for the position. Ball carriers Dustin Sanchez, Lawrence Toledo and Mike Archuleta should again be in the mix, along with receivers Colten Jackson and Ocean Hunter, but Garcia stressed that offensive line performance will be most vital of all. Getting enough players to work on the offensive line will be crucial, he added, with at least five players needed. Against Centauri and Monte Vista, again the Southern Peaks’ likely front-runners, more would certainly be better. Ultimately, Garcia knows success or failure will be determined by a simple concept. “Understanding,” he said. “Understanding the few plays that we’re trying to insert, and to make them understand their jobs – what every kid has to do – for whatever play’s called. Ignacio is set to open at 1 p.m., Aug. 25 against Leadville-based Lake County, which had a 2-7 record in 2017 and went 1-4 in league play. Aug. 25: vs. Lake County, 1 p.m.
Aug. 30: at Crownpoint, New Mexico, 7 p.m.
Sept. 7: at Newcomb, New Mexico, 7 p.m.
Sept. 14: vs. John Mall, 7 p.m.
Sept. 29: at Colorado Christian, 1 p.m.
Oct. 5: vs. Center*, 7 p.m.
Oct. 12: at Monte Vista*, 7 p.m.
Oct. 19: vs. Dolores*, 7 p.m.
Oct. 26: vs. Centauri*, 7 p.m.